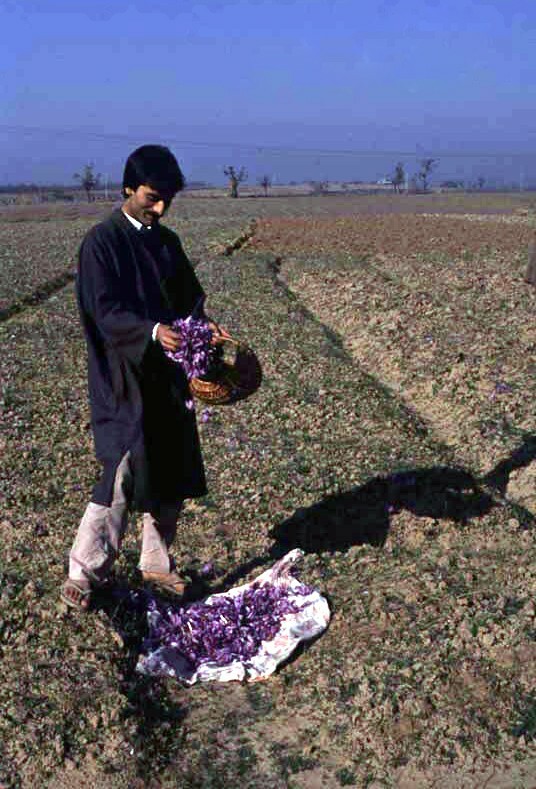 Kashmir is the only place In India and one of the few places in the world where saffron, the world’s most expensive spice, grows; to be more specific, it grows only on the plateau land of Pampore, just outside Srinagar. 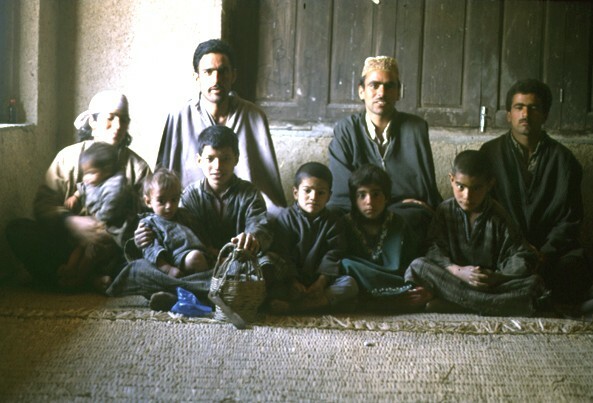 Saffron is not grown on any of the other fertile alluvial plateaus of Kashmir, and the people of Pampore are fond of saying that there is a certain magical element in the soil of Pampore which helps the flowers to bloom and the stigmas to be imbued with aroma. 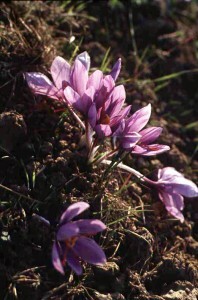 Neighboring states did in fact make efforts to grow saffron. All went well at first—the weather, the moisture, everything was perfect. At length, the flowers bloomed, but when the stigmas were plucked, they had not a trace or spice in them. By the middle of October each year, the undulating plateau of Pampore is covered with a mauve blanket of the delicate flowers of the crocus sativus. Because of the short life of these exquisite blooms—only two weeks in the whole year—Kashmiris flock to Pampore like excited tourists. Every vehicle that passes by these fields pauses for a moment to gaze reverently at the sight. But it is on full moon night when rows of cars driven from Srinagar, line the road. 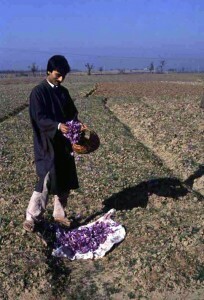 Families come to watch the magical spectacle of miles of mauve carpeting the soil while the silver moonlight sharply etches each petal. 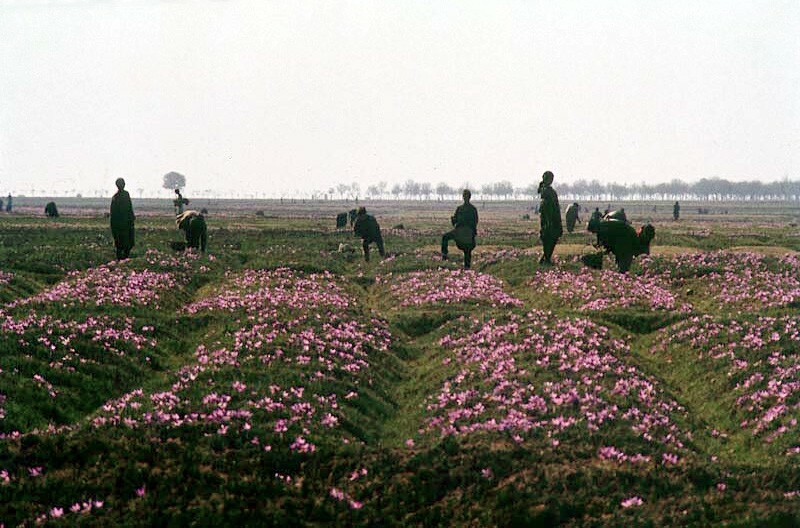 In an adjoining room, mounds of saffron are being graded according to their quality. Bereft of any furniture, a single window lets in a beam of light which picks out the rich colours and textures of the cramped space—rough mud coloured walls, a straw mat on the floor, the bright liquid eyes of a child who watches the scene with intensity. In the dim light six women sit on the floor, their heads bent in concentration while they separate the worthless golden stigmas from the mongra. Their movements are deft, with a steadiness born of long practice and synchronises with the flash of a woman’s gold earring as it catches the Light. Suddenly, the patriarch to one comer of the room puts down his weighing scales and lights up his hookah. As he pulls on the pipe, clouds of smoke reach out to the beam of light with its dancing motes of dust, and the heady, almost intoxicating aroma of saffron is overpowered by the stronger smell of the hookah.